OLYMPIC champion Kyle Chalmers was a last minute withdrawal from tonight's 100 metres freestyle final at the Australian Short Course Championships in Brisbane tonight with a sudden attack of Supraventricular tachycardia (SVT). The 18-year-old, who had been diagnosed with the condition - which causes an abnormally fast heart rhythm - before the Olympics, complained to his coach Peter Bishop, 20 minutes before the race, when his heart-rate started to increase rapidly. Doctors examined Chalmers and ruled him out of the final, with officials replacing him with first reserve William Stockwell. Chalmers was quick to recover and walked out of the medical room at the Brisbane Aquatic Centre, joining coach Bishop and the South Australian Institute of Sport Team. 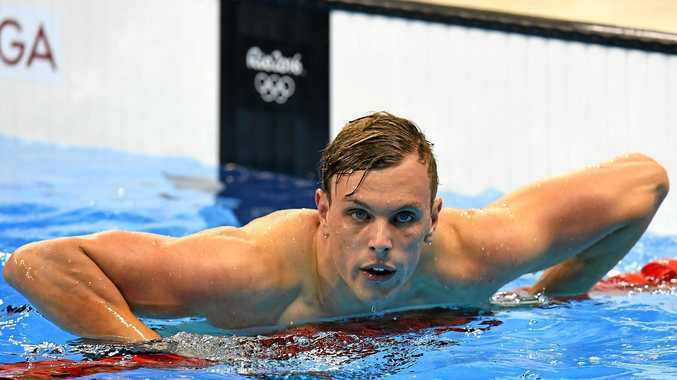 Swimming Australia's national head coach Jacco Verhaeren spoke on behalf of Chalmers saying the doctor had ruled him out of the final but also said he could race again in the 200 metres freestyle tomorrow. "It is a condition that we have always been aware of and also of treatment that he has undergone,” said Verhaeren. "It is something we knew about in the lead up to the Olympics and obviously we are guided by the doctors. "It is something that is not a major heart condition but when it comes his heart rate escalates quickly. Verhaeren also said Chalmers was "devastated” at not having the opportunity to race his pet event and to have the chance at winning his first national title which went to defending champion and long course champion, Olympic finalist Cam McEvoy from Bond. McEvoy, who is only just back into light training surprised himself, clocked a personal best time of 46.19 (21.97) - under the required qualifying time for the World Short Course Championships in Windsor, Canada in December. London Olympian Tommaso D'Orsogna, undergoing resurgence under new coach Ashley Callus at Somerset College on the Gold Coast clocked 46.63 for the silver - also under the required time. McEvoy is yet to decide whether he will make himself available for the World Championship meet. Chalmers had set his sights on making the team, given he had set a new junior world record of 46.12 to win the World Cup meet in Tokyo two weeks ago. Verhaeren said the Swimming Australia Selection Committee consisting of himself, General Manager Performance Wayne Lomas, SAL board members Nicole Livingstone and Graeme Johnson and NSW Technical Delegate representative Neil Rogers will have the first of their selection meetings tomorrow (Friday). In other events tonight dual long course world champion Emily Seebohm started a great night for David Lush's Brisbane Grammar team when she won the 200m backstroke final - her second gold of the day and her ninth Australian Short Course title in a World Championship qualifying time of 2:01.82 from 18-year-old Amy Forester (Bond) 2:04.78 and 15-year-old Kaylee McKeown (USC Spartans) 2:05.42. Earlier in the day Seebohm won the 50m butterfly and will line up in the 50 and 100m backstroke events over the next two days of competition. Seebohm's Rio teammate, relay golden girl Brittany Elmslie won the women's 100m freestyle in 52.36 from fellow Olympic medallists Maddie Groves (SPW) 53.10, Madison Wilson (SPW 53.19) and Bronte Campbell (Commercial) 53.21. While fellow 17-year-old Grammar girl Calypso Sheridan took out the 400 IM in 4:38.94 from Mikkayla Sheridan (SOPAC) 4:36.21 with Tianni Gilmour USC Spartans) 4:39.21 third. Paralympic stars Lakeisha Patterson (Lawnton) 1:06.62) and Ellie Cole (Castle Hill RSL) 1:02.94) went 1-2 in the 100m freestyle multi-class while their Rio team mate Daniel Fox (Chandler) won the 100m multi-class for men in 53.20 from Mitchell Kilduff (SLC Aquadot) 53.29 and Braeden Jason (USC Spartans) 53.51.